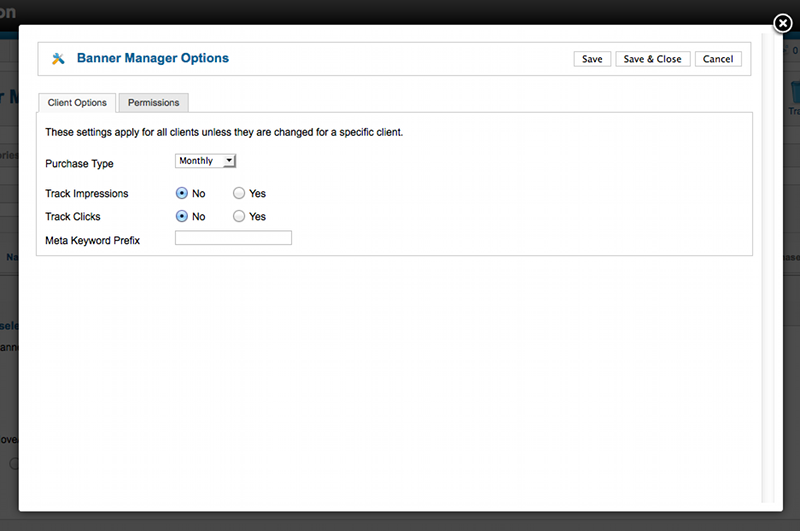 Select Components → Banners → Banners from the drop-down menu of the Joomla! Administrator Panel. You can also select the 'Banners' menu link from the Banner Categories Manager, Banner Clients Manager or the Banner Tracks Manager. You can filter the list of items by typing part of the banner's name or the ID number of the banner. Edit. Opens the editing screen for the selected banner. If more than one banner is selected (where applicable), only the first banner will be opened. The editing screen can also be opened by clicking on the Title or Name of the banner. Publish. Makes the selected banners available to visitors to your website. Unpublish. Makes the selected banners unavailable to visitors to your website. Archive. Changes the status of the selected banners to indicate that they are archived. Archived banners can be moved back to the published or unpublished state by selecting "Archived" in the Select Status filter and changing the status of the banners to Published or Unpublished as preferred. Check In. Checks-in the selected banners. 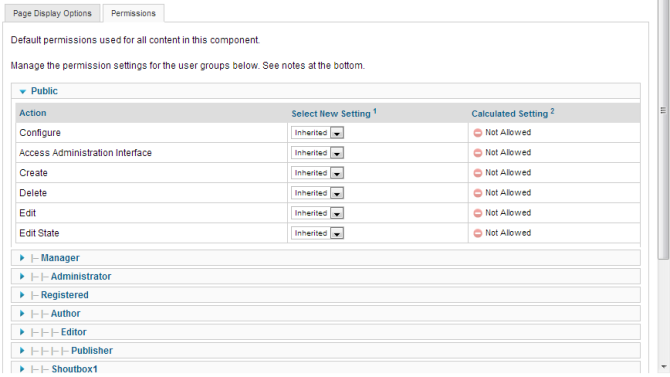 Works with one or multiple banners selected. Trash. Changes the status of the selected banners to indicate that they are trashed. 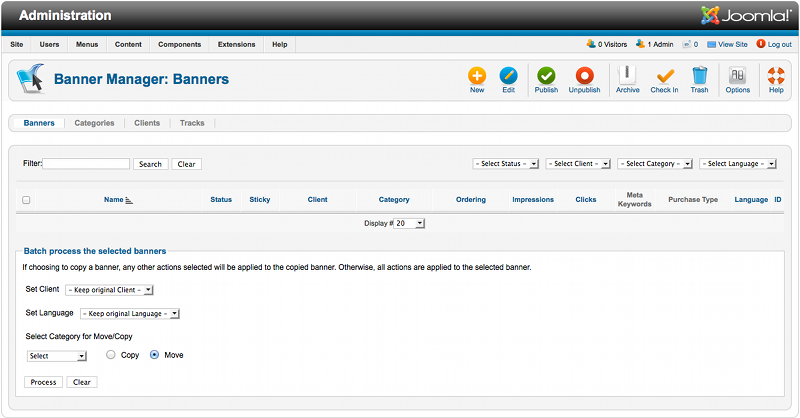 Trashed banners can still be recovered by selecting "Trashed" in the Select Status filter and changing the status of the banners to Published or Unpublished as preferred. To permanently delete trashed banners, select "Trashed" in the Select Status filter, select the banners to be permanently deleted, then click the Empty Trash toolbar icon. Track Impressions. (Yes/No) Whether or not to count how many times a Banner is displayed. Track Clicks. (Yes/No) Whether or not to count how many times a Banner is clicked. Change an banners state (Publish, Unpublish, Archive, and Trash) in the component. This page was last modified on 21 March 2013, at 08:41.